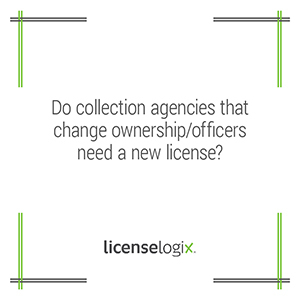 Many factors contribute to whether a collection agency must obtain a new license, if owners or officers of the collection agency change. Although collection agency licenses are generally not transferable or assignable, the requirement of a new license is heavily dependent on the extent to which the organization has changed. In some jurisdictions, a new license is required if ownership has changed by a certain percentage. That percentage can vary from 10 - 51 percent. Other jurisdictions only require a new license if the EIN has changed. If a collection agency license that changes ownership does require a new license, the existing license will need to be cancelled or surrendered. This cancellation process varies by jurisdiction. A number of jurisdictions do not require a new license, but do require amendments to the existing license detailing new ownership structure, name changes, and address changes, as well as new officers, and/or controlling individual information, etc. Some of these requirements can be nearly as rigorous as the initial application process. For example, Wisconsin requires: proof of surety company notification of new ownership, financial statements, purchase agreements, resumes and criminal background reports for each new officer, along with various supporting legal and organizational documents. Another issue to consider when changing the ownership of a collection agency is what the reporting requirements are for the State business entity registration with the Secretary of State or Department of State. Some of these reporting requirements may vary from updating ownership, officer, and address information on the next annual report, while other jurisdictions may require an immediate update of the information by amending the current entity registration. In order to remain compliant and avoid costly penalties, LicenseLogix will help you determine whether a new license is needed, and if not, what the requirements are for maintaining your current license. Contact us today to get started.